A telekinetic teenager. A doomed ocean liner. A haunted bed & breakfast. A zombie-fighting real estate developer. These are but a few of the eerie people, places and things that go bump in the pages of Asbury Dark: Haunting Tales from the Jersey Shore. 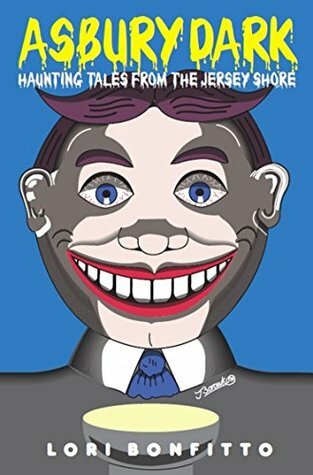 Spanning six decades, Asbury Dark will thrill and delight anyone who’s ever ridden the rides on the fabled boardwalk, searched for Bruce at The Stone Pony, or shambled along in the Zombie March. Mystery and suspense author Lori Bonfitto delivers seven unforgettable tales of fright and fantasy, transforming Asbury Park from a nostalgic playland into a world fraught with obsession, reincarnation, and the paranormal. This was a very, very entertaining read with eerie twists and turns woven into each story. What made this collection unique to me was that every story was centered around the same town and most of them took place there. It was easy to imagine that somehow all of the different stories were woven together. It was like meeting a bunch of different neighbors that live on the same street and hearing their stories. That made it super cool for me. There was also never a time where I felt like I had to skip a story. When I am reading a collection, I sometimes find that a story in the middle of it is less interesting than the rest, and I will skip it to get to the better ones. That wasn’t the case here. I genuinely enjoyed all of the stories that were a part of this collection in their own way. They were all different, but as I stated before, they all seemed wove together, and they fit together well. For short story lovers who want a hint of creepy, spine-tingling fun, I would definitely suggest you grab a copy.